Passenger may enjoy a fare discount on the below GMB service when interchanging from this trip (Central bound) by using the same Octopus within 75 min. 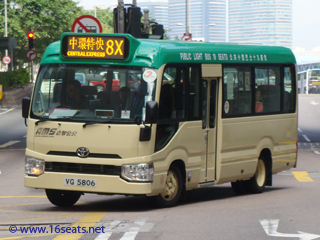 - interchange from designated KMB cross harbour route (HK Island bound) to this trip within 180 min. For details, please refer to KMB website. Passengers may enjoy free transit to Lower Baguio Villa terminus for Central bound by boarding HKI GMB route 8 or this route at Upper Baguio Villa. Passenger may enjoy a fare discount on this trip (Lower Baguio Villa bound) when interchanging from the below GMB service by using the same Octopus within 75 min.